During the recent episode of Into the Ether, Ethereum founder Vitalik Buterin discussed all things related to Ethereum. One subject that popped up was the governance model of Ethereum. Interviewer, Eric Conner asked Buterin to talk on-chain governance models. Especially his thoughts on how Ethereum governance compares to them. According to Buterin, the current Ethereum governance model is perfect. This is true considering the issues it has guided the Blockchain project through over the years. Buterin says the model implemented the issuance reductions. When the system was in crisis in 2016, it implemented a hard fork in 6 days. When the Constantinople bug issue came up, it delayed the fork for a few hours. The Ethereum governance model is achieving the things that the governance of any protocol should achieve. This includes making changes that people want as opposed to making unnecessary changes. The one thing it isn’t achieving is fund recovery, dispute resolution, or other things in that category. Another thing it isn’t achieving is the decentralized funding of public projects. Buterin says both things can cause more harm. In dispute resolution and fund recovery, the Ethereum founder describes it as opening a “Pandora’s box.” When can you draw the line if transactions lose immutability? Regarding the decentralized funding of the public good projects, Buterin says its easily gameable anonymously. Later in the same episode of Into the Ether, Buterin speaks on privacy in Ethereum. 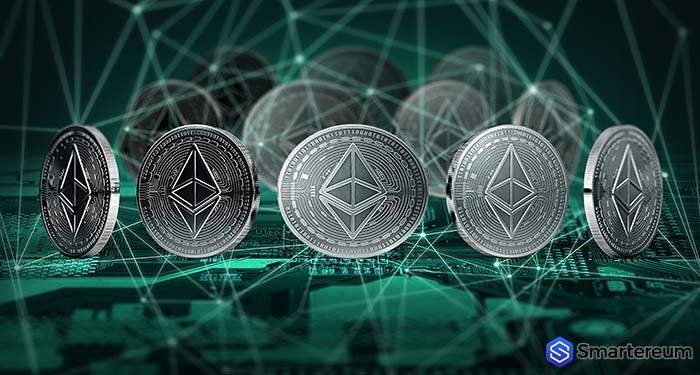 The Ethereum founder says he is working on a patch to make it difficult to know if the same wallet has been interacting with multiple dApps. According to the host, he utilizes a different Ethereum wallet for each dApp, to protect his privacy. Buterin and Conner agree that privacy is essential for the long term viability of Ethereum. Should everything not be sufficient enough, the only option or solution according to Buterin is some inflation funding. He believes Zcash will be a capable alternative. The Zcash community boosts similar values to Ethereum in many cases. They are willing to be aggressive in a more centralized decision making. One major takeaway from Buterin’s interview is his views regarding the current size of Ethereum’s Blockchain. He considers just two scaling solutions as viable regarding tackling the issue of size in the Ethereum Blockchain. One of the proposed solutions involves changing how smart contracts exist into a “stateless” model. Secondly, charging smart contracts rent whenever they conduct storage-related transactions. However, Buterin says the second option may have a serious vulnerability to attacks. According to him, motivated parties could attack the new model by creating many storage-inducing transactions. Which is the best cryptocurrency to invest 2019? Previous articleWill Cryptocurrencies Continue to Surge Higher Despite Minor Gains?